Apple today quietly discontinued and replaced its 29W USB-C Power adapter with a new revised USB-C Power Adapter that offers 30W. The 30W USB-C Power Adapter that's replacing the 29W version is designed for the 12-inch MacBook. It's also commonly used as an option for those who want faster charging for compatible iPhones and iPads that support fast USB-C charging speeds. 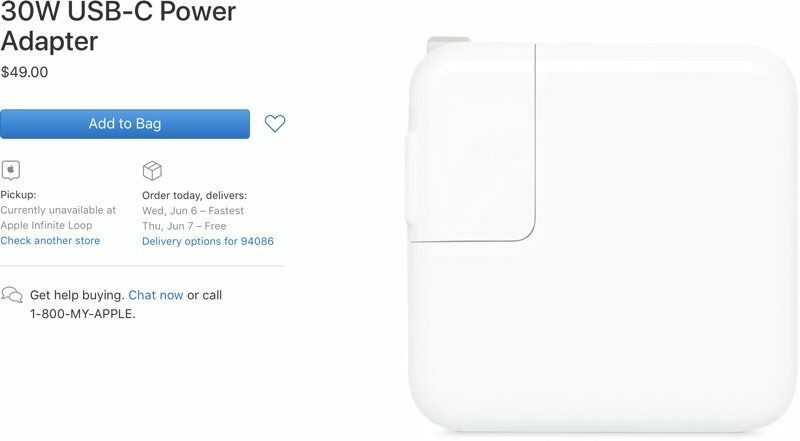 It is not clear why Apple replaced the 29W Power Adapter with the new 30W Power Adapter, but the pricing remains the same at $49. The new accessory is not yet in Apple Stores, but can be ordered today for Wednesday delivery. Apple has not tweaked its other USB-C Power Adapters designed for the MacBook Pro lineup, with those accessories continuing to be available in 61W and 87W options for 13 and 15-inch MacBook Pro models, respectively. Who said they weren't going to release new, innovative hardware at WWDC? I heard that if you recently bought the 29W adapter, that Apple will send you the other 1W for free. With the 1 extra watt, Safari seems snappier. You heard of this thing, the 29W Adapter? Yeah, this is going to blow that right out of the water. Listen to this: 30. Watt Adapter. Think about it. You walk into an Apple store, you see 29W Adapter sittin' there, there's 30W Adapter right beside it. Which one are you gonna pick, man? The first-gen Apple USB-C adapters were not USB-PD compliant. In particular, they are missing 9V output, and thus cannot fast charge some Android USB-C phones. I wonder if this one adds it, in preparation for the next gen iPhones. Unless, of course, somebody comes up with a 31 watt adapter. Then you're in trouble, huh? No! No, no, not 31! I said 30. Nobody's comin' up with 31. Who charges with 31 watts?